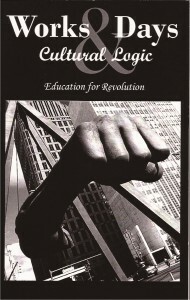 Education for Revolution a special issue collaboration of the journals Works & Days and Cultural Logic has just been launched. Check out the great cover image (Monument to Joe Louis in Detroit) and the equally great stuff on the inside. Hard copies of the issue available from worksanddays.net and Cultural Logic will be publishing and expanded online version of the issue in the coming months. Rich and I want to thank David B. Downing and his staff at Works & Days for the fabulous work they did on this issue, which is the second collaboration between the two journals. Read Downing’s foreword to the issue here.